*Fees are effective for confirmed private tour bookings made after January 31, 2016 and are calculated based upon the number of adult guests (i.e. persons above 16 years at the time of the tour). The chart is structured as a matrix with the fee amount increasing incrementally for each additional hour and each additional participating adult. Naturally, each private tour participant (adult or child) can expect to receive my personal attention. Children 16 and under are FREE OF CHARGE (this applies to the age at the time of the booking). Tours over 8 hours priced on request. Maximum twelve hours per day. For more than 6 people add US$60 per person on top of the 6 person fee-maximum 8 persons. Groups larger than 8 by special request. Please inquire. If you book a tour then you are booking a tour with me, I do not employ other guides. If you do have any special requests or interests (such as history, culture, shopping etc.) then I am more than happy to incorporate these on tour and you should let me know about these as soon as possible. 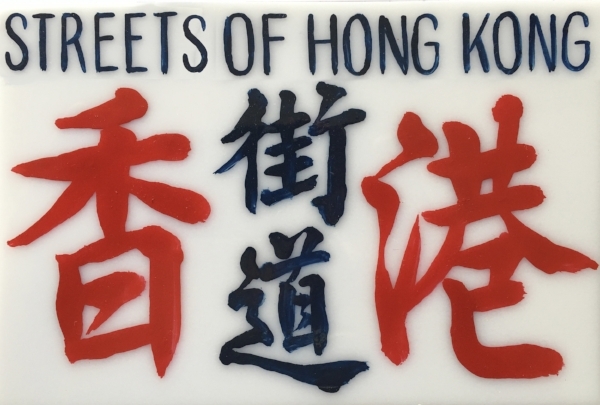 An 8 hour tour is my most popular format and is particularly appropriate for those having just one or two days to explore Hong Kong and Kowloon. Please note that my fee schedule has remained fixed since January, 2016. If you book for example an 8 hour tour, you CANNOT split the tour across 2 days. In this instance, this would be viewed as 2 separate tours and priced according to the price list. Tour fees only cover my private tour and do not include other costs and expenses such as transportation, meals and refreshments (see General Terms and Conditions below). My fee which is on USD$ is payable in cash, you can pay in either HK$ or USD$, whichever is most convenient for you. The exchange rate used is USD$1 = HK$7.78. I do not require a deposit or payment in advance before the day of the tour, we will settle up in cash on the day of the tour ‐ please note that I am able to take payment by Mastercard or Visa on PayPal if you wish, just let me know ‐ for credit card payment you will need to pay 5 working days in advance. I DO NOT CHARGE A SURCHARGE FOR MEETING YOU OUT OF THE CENTER OF TOWN OR AT THE AIRPORT OR THE KAI TAK CRUISE SHIP TERMINAL. I AM VERY HAPPY TAKING LOTS OF PHOTOGRAPHS OF YOU AND YOUR GROUP WHILE ON TOUR AS A FULLY COMPLIMENTARY SERVICE. PROFESSIONAL PRINTING AND FRAMING CAN BE ARRANGED IF REQUESTED AT COST. The following are my general terms and conditions. Please review them carefully before you book your premium tour. I do not require a deposit or payment in advance before the day of the tour, we will settle up in cash on the day of the tour ‐ please note that I am able to take payment by Mastercard or Visa on PayPal if you wish, just let me know ‐ for credit card payment you will need to pay 3 working days in advance. My fee which is USD$ is payable in cash, you can pay in either HK$ or USD$, whichever is convenient for you. If for any reason you want to cancel your tour, simply email me a notice to cancel. I will confirm your cancellation by email. You may cancel your tour anytime up to ten calendar days before the scheduled tour date without any further obligation. If you cancel your tour 4-10 calendar days before the scheduled tour date, you will be obligated to pay 50% of the tour fee. If you either (x) cancel your tour within 72 hours of the scheduled tour date or (y) don’t show up for your tour, you will be obligated to pay 100% of the tour fee. Although I undertake to be flexible, all rescheduling requests are discretionary and subject to my calendar. I will pick you up and drop you off at your hotel or another mutually agreed location such as the airport or a cruse ship disembarkation point. Guests staying on Lantau Island will be met and dropped at the Airport Express terminal at Kowloon Station or Central. All tours are private and performed personally and exclusively by me. YOUR KIND ATTENTION PLEASE: I AM NOT LICENSED TO PERFORM TRAVEL AGENCY SERVICES AS PROVIDED IN SECTION 218, PART II, Section 9 OF THE HONG KONG SAR TRAVEL AGENT’S ORDINANCE. Accordingly, I am strictly prohibited from arranging and booking any kind of third party attractions, international or local carrier transportation, lodging, meals or other similar third party services on your behalf. If you do not wish to do so directly, it is strongly recommended that you contact a licensed travel agent or your hotel concierge to arrange any kind of third party services during your stay in Hong Kong. The tour fee only covers my private tour. Your cost of public transportation such as taxis, buses, mini buses, ferries, The Peak Tram, The MTR and Airport Express. I pay for my own travel costs with the exception of taxi fares, the Nong Ping 360 Cable Car and the Macau ferry. As a rule of thumb, anything I can pay with my octopus card, I will take care of on my own. Refreshments and meals, if any, along the way. Attraction entrance fees, if any (I pay for my own). Souvenirs and other items purchased on tour (Not included in tour price). All of the above costs and expenses are to be covered by you on a pay as you go basis and I will cover all of my own expenses. Please be sure to bring a sufficient amount of local currency to cover the above. Bear in mind that credit cards may not be accepted in some establishments, particularly restaurants. A minimum of $500 HKD is recommended to be safe. I will inform you if any attraction entrance fees are anticipated. For speed and convenience, it is strongly recommended that you obtain an OCTOPUS CARD for public transportation. Please consult your concierge. I can also assist you in obtaining same on the tour date. You can obtain same from the Station Office in any MTR Station. ALL TOURS ARE UNDERTAKEN AT YOUR OWN RISK. I ACCEPT NO LIABILITY OR OBLIGATION IN THE EVENT OF ILLNESS, INJURY, DEATH OR LOSS OR DAMAGE TO PERSONAL PROPERTY. YOU AGREE TO NOTIFY ME IN ADVANCE IN WRITING OR BY ELECTRONIC COMMUNICATION OF ANY HEALTH, MEDICAL CONDITION, MEDICATION OR FOOD OR ALLERGY ISSUES THAT COULD POTENTIALLY AFFECT YOUR ABILITY TO PARTICIPATE IN TOUR RELATED ACTIVITIES. PARENTS ACCEPT FULL RESPONSIBILITY FOR THE BEHAVIOUR AND ACTIONS OF THEIR CHILDREN WHILE ON TOUR. IT IS STRONGLY RECOMMENDED THAT YOU ARRANGE FOR CUSTOMARY TRAVEL INSURANCE COVERING, INTER ALIA, ACCIDENTS, PERSONAL INJURY, PROPERTY LOSS AND EMERGENCY MEDICAL SERVICES. Please bear in mind that my tours are walking tours incorporating public transport as needed. Although not particularly strenuous, you should bear in mind that parts of Hong Kong are hilly and the weather can be very hot and humid at certain times, particularly the Summer. In this regard, you should consider your ability to engage in medium aerobic urban style walking. If you are unsure about this, please consult your personal physician. Hong Kong follows British style traffic flow and crossing rules. To avoid accidents, please be vigilant and remember to follow all road crossing signals and traffic warnings . Tours will proceed in all weather conditions unless the Hong Kong Observatory has issued a NO 8 TYPHOON WARNING or a red or black rain storm warning, in which event the we shall in the spirit of good faith and common sense consult on cancellation or rescheduling subject to my calendar availability. 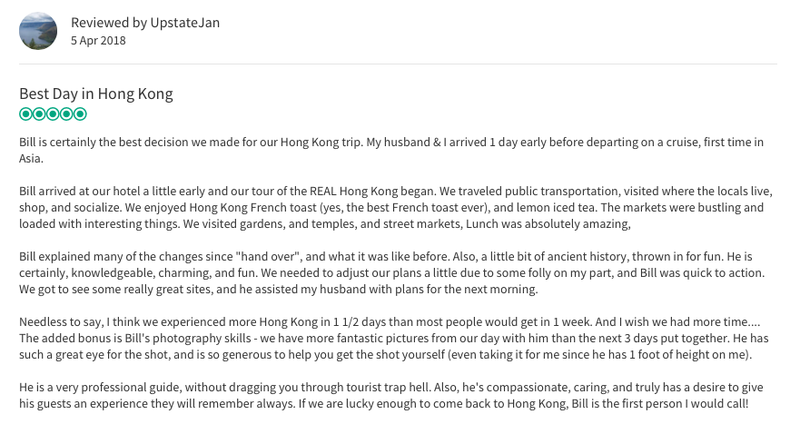 I have undertaken my best efforts to ascertain the accuracy of all written and oral information provided to you with regard to your private Hong Kong tour. However, no express or implied warranties are given. I make no warranty and assume no responsibility for the performance of third party vendors and businesses visited while on tour. I will not accept any commissions from any third party in connection with any business establishment visited or business transacted by you while on tour or any other referral or recommendation made by me. I do not pay any referral fees to any third parties such as a hotel concierge or travel agency for your valued patronage. Information Collection, Use, and Sharing: I am the sole owner of the information collected on this site. I only have access to/collect information that you voluntarily provide via email or other direct contact from you. I will not sell or rent this information to anyone. I will use your information solely to respond to you, regarding the reason you contacted me. I will not share your information with any third party, other than as necessary to fulfill your requests, for example to refer you to another recommended tour guide colleague. Security: I take reasonable commercial precautions to protect your information. When you submit sensitive information via the website, your information is protected both online and offline. I accept remittances via PayPal as a secure payment intermediary. If you transmit to me your Paypal User ID, I will take appropriate measures to maintain the secrecy of same. Under no circumstances should you transmit to me your other credit card or similarly sensitive payment details. Unless otherwise notified by you, I reserve the right to use any photographs taken by me while on tour for publication on my websites. You have my permission to use all photographs taken by me on your tour freely for any non-commercial purpose..